Ranked no.72, before this Roland Garros edition, Marco Cecchinato has never managed to win a match in a slam. Then things started to click at this French Open, and just out of the blue the Italian defeated in succession Pablo Carreno Busta, David Goffin, and now the great Novak Djokovic. The contest against the Serbian legend was pretty weird. In fact, after conquering a surprising 2-0 set lead, the Italian looked doomed after Djokovic staged a fierce comeback to win the 3rd set 6-1 and lead 4-1 in the 4th. Eventually, Djokovic squandered 3 break points and the opportunity to clinch a 5-1 lead, and the Italian recovered the deficit to bring the affair to the breaker. The tiebreak was full of drama. In fact, after wasting a 3-0 lead, the Italian had to save 3 set points while he was down 6-7, 7-8, and 8-9. Instead, it was Cecchinato to win the set and the contest after converting his 4th match point. The final score was 6-3 7-6 (4) 1-6 7-6 (11). The last time that an Italian reaches a Grand Slam semifinal after Corrado Barazzuti at the French Open in 1978. 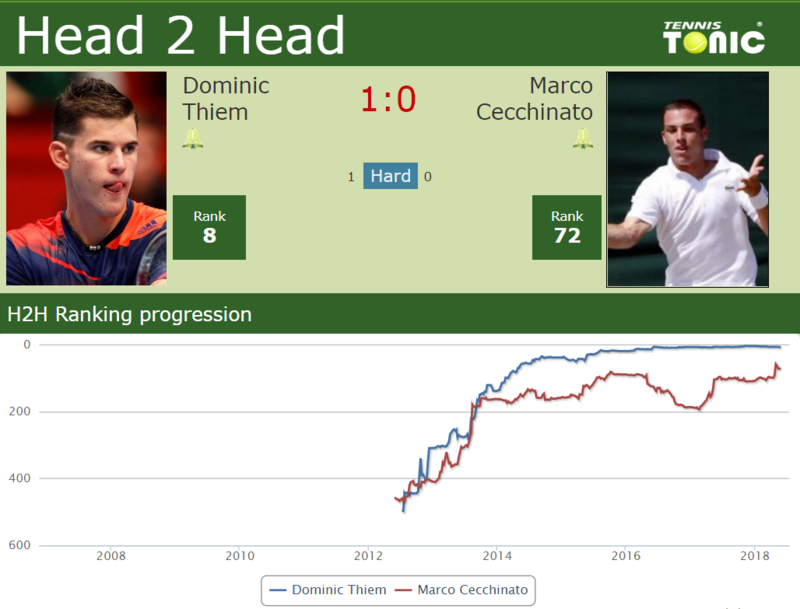 Cecchinato will face Dominic Thiem in the semifinal. The head to head is 1-0 for the Austrian that is the hot favorite to reach the final. Cecchinato will do everything he can to reverse the odds.